Earlier this week Master Chim taught an excellent first class at New Rochelle’s brand new location. Right now they are at 714 north avenue. They are now right across the street from Iona College! It was another memorable event for the Jungle Gym tribe. Jungle Gym New Rochelle’s future looks brighter than ever. Yesterday was an excellent promotion event. We had 4 new students complete the Instructor Certification Course. Shout out to Joel, Spyros, John, and Jensen for making it happen. We had 3 of our brothers and sisters from New Rochelle walk the gauntlet to earn their blue belts. Congratulations to Zach, Joal, and Kelly! Stay the path! Ethan “Tyrion” Olavarria received his purple belt. This is good news for all of the purples and browns that were getting tossed around by a blue belt and eating overhands. Now they can get worked over by a purple belt lol! School is back in session, and so is the Jungle Gym’s After School program. Throughout the school year, we here at the Jungle Gym will be providing a safe and productive place for parents to have their kids spend their time in. In our After School program, kids will have homework time, where coaches will assist kids with their school work. A long with that kids will have a martial Arts class exclusive to the after school students. One of the biggest benefits of the after school program, is the accelerated development of their Jiu Jitsu techniques. This is due to the simple fact that they’re spending more time on the mat along with more one on one attention. For parents interested in the program let us know at the front the desk. 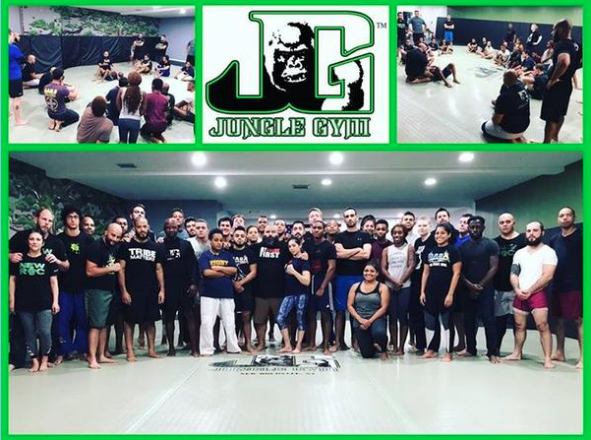 Lions of Leadership Open Mat is Every Sunday at HQ and Next Month on October 14th at Jungle Gym New Rochelle. These are great training sessions so do your best to be there. School is back in session! We here at the Jungle Gym don’t us the term ‘Good Luck’, so I’d like to say make it happen to our teens students entering the next grade. A great thing about Martial Arts is that it transcends what we do here on the mats, this is something help you in all aspects of life. We fully expect our teens to tackle the school year with the same effort and determination that they show on the mats. I want to give a special shout out to two long time teens students Adam Rodriguez and Josh Richards on taking the next step in their academic careers with starting their first semesters in college. These two are no strangers two Pressure, being on the mats here at the Jungle Gym, so I have no doubt that they’ll be successful in any endeavor they take on. Not to long ago I had the privilege of coaching a young lady through a one on one session. She was skilled so I chose to turn the intensity up as any good coach should. Now towards the end of one of her rest sessions during the work out I reassuringly told her “Your doing great! Let’s get back to work”. To which she replied “I worked hard,Coach. I should rest hard.” I laughed..she wasn’t entirely wrong. There’s nothing better then a good rest after a hard workout. AFTER being the key word in that sentence, however.There’s no “hard rest” while there’s work to be done,ladies we have to strive for that healthy lifestyle together! This weeks student spotlight goes to all that participated in in New Rochelle’s inaugural class. Ritual and participation is a very important part of building the strong tribe that we have.